20,000 Voices encourages everyone to enjoy singing. It is our mission to provide a first class service to anyone who wants to sing. 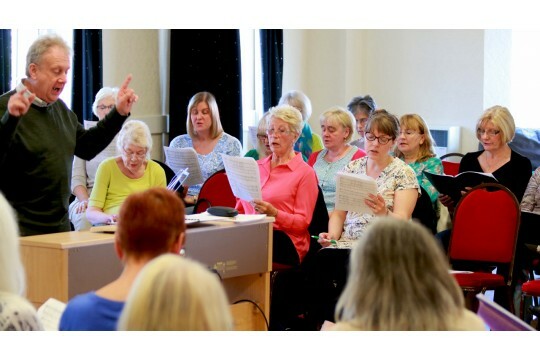 We provide opportunities for: Regular singing for all kinds of community groups; Workshops with inspiring leaders; Courses & projects for technical & vocal development We also work in partnership with other organisations to provide great opportunities for existing and new singers - even those who think they can't sing, to enrich their experience. During the past 22 years 20,000 Voices has created a great singing community, introducing more than 150,000 singers to the enjoyment of singing. Many singers and choirs rely on our service for information, support, guidance and inspiration. We want our work to continues providing opportunities to all to gain from the health & well being benefits of singing. Increasingly we work in the wider community, with young people, with dementia, in prisons, because they deserve these opportunities. Our target is to raise £20,000 from individual giving over the next 2 years to enable us deliver our core activities. We wish to provide new singers with opportunities in their locality; we want to be able to stretch and develop the skills of our regular singers, we hope to secure funds to continue delivery of the wide variety our work into the future, which so many people value. At our current rate, we will be able to with another 6,500 voices in the region during the next 2 years.